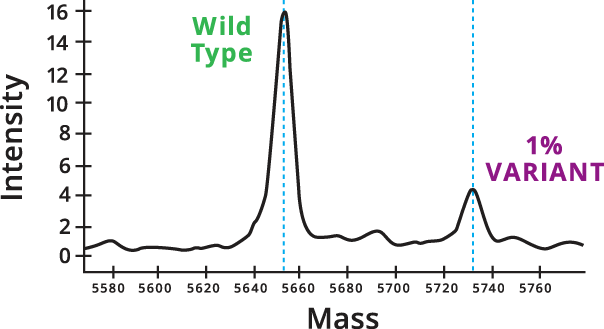 The MassARRAY Dx System is Matrix-Assisted Laser Desorption Ionization – Time of Flight (MALDI-TOF) mass spectrometer customized for the precise detection of DNA molecules. The molecules are distinguished by their time-of-flight after being ionized in a vacuum chamber. Direct analysis of the mass of the molecules eliminates the need for fluorescence or other labeling whilst simulateously making the technology highly sensitive and cost effective. 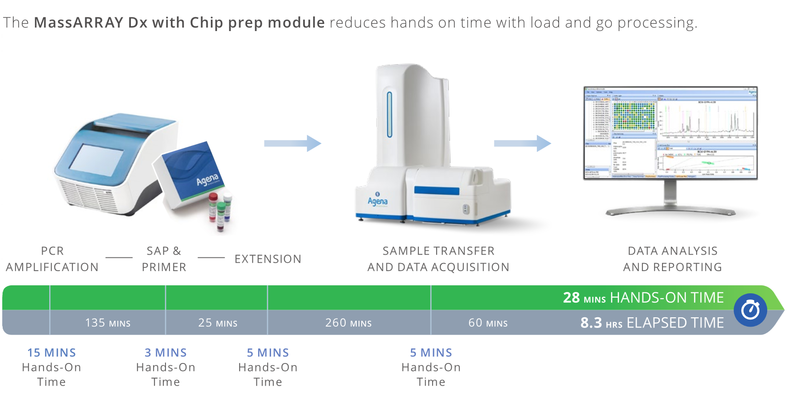 SPECTROCHIP ARRAY: The SpectroCHIP Array comes in a 96 pad format, upon which the sample is dispensed. The DNA extension products or analytes co-crystallize with the matrix. 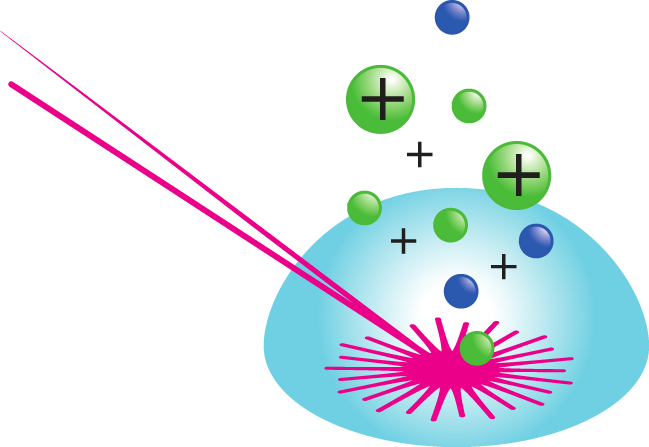 DNA IONIZATION: The analyte crystals are irradiated by a laser, inducing desorption and ionization of the molecules. DNA SEPARATION: The positively charged DNA molecules accelerate up the vacuum tube towards a highly sensitive detector. The speed of the molecules is proportional to the mass of the individual extension products and separation occurs by time-of-flight. The software processes the time-of-flight and differentiates the variants by their mass, producing a mass spectrum. ANALYSIS: The integrated software provides a user-friendly interface to generate reports which identify the targets and review spectra. All chemistries utilize a simple workflow with convenient, universal reaction conditions and general use reagents, generating results in as quickly as a day. The MassARRAY® System is a flexible platform that allows you to perform a variety of DNA analyses with different chemistries tailored to your biomarkers of interest. 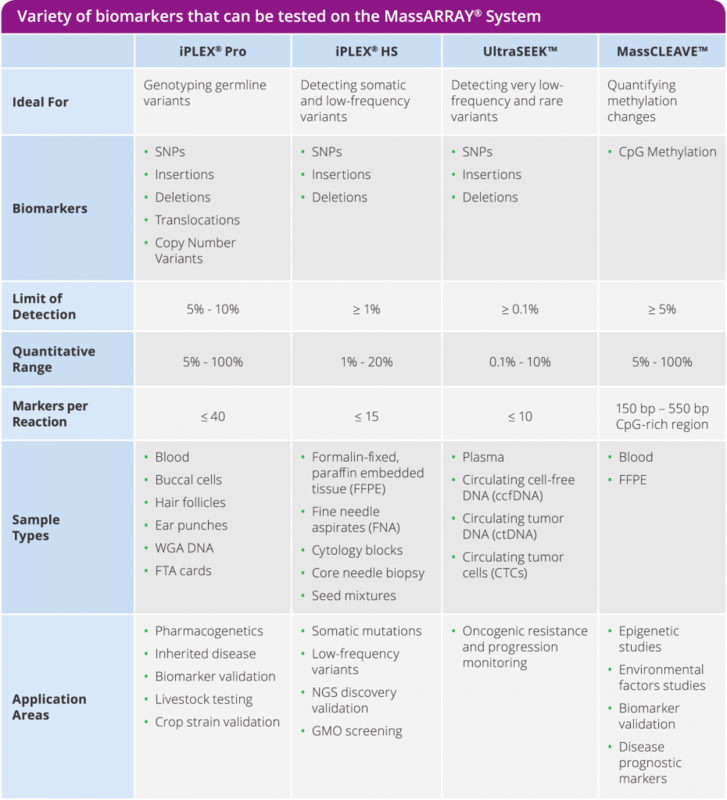 With general purpose reagents and standard, non-labeled oligonucleotides, generating custom assays is simple, fast, and cost-effective. 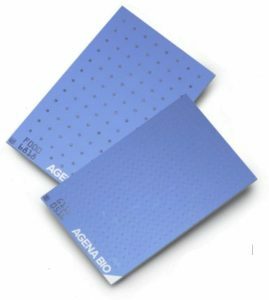 SEQ-IT provides custom assay design service in the fields of genotyping, somatic mutation, or epigenetic.